I remember the first day I walked into our local resource center. We were making food bags for kids to take home from school on the weekend. And I was like – why? Well, because these kids don’t have anything to eat when there isn’t a school lunch program. Like on weekends, holidays, etc. Now, I will admit — my mind immediately turned to the fact that the WIC program and SNAP (food stamp) programs in the US really should be taking care of any food issues that families have. Of course, for a number of reasons, families might not be using those resources, and yes — possibly mis-using them. But, that doesn’t take away from the fact that the kids ARE hungry and that takes away from their learning, their growing and their thriving! In Arizona, 1 in 3 kids grows up in poverty. SO, I wanted to do something about it. 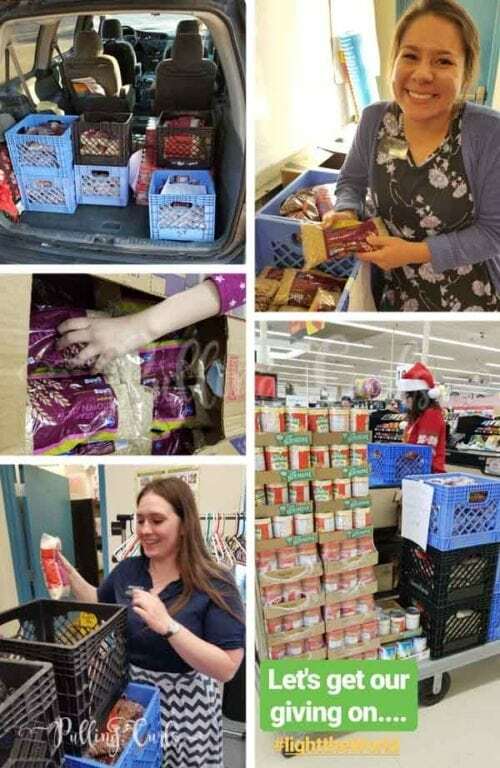 In partnership with BonCom (an arm of the Church of Jesus Christ of Latter-Day Saints) for their #LightTheWorld campaign – I contacted our local resource center and set up a time to drop up a large amount of product for their weekend bags. I am lucky in that our school district has a resource center for poorer families to be able to pick up food and material things to survive day to day. That made it easy to donate to hungry kids. I also put out the call to friends and neighbors that if they’d like to donate, they could. The response was great, families were excited to help (especially in the holiday season). I also contacted our school resource officer at our Middle School to see if that school had any needs. She had been wanting to put together a Christmas meal for some of the larger and poorest families at the school. I was lucky enough to find hams on sale (the store would hold them until I needed them, so I didn’t have to worry as much about long-term refrigeration). I also bought some easy to prepare boxed foods for families to enjoy with the meal. We distributed them to needy families one day at school pick-up time. The familes were SO thankful. The thing is — this type of project can be done at any time. 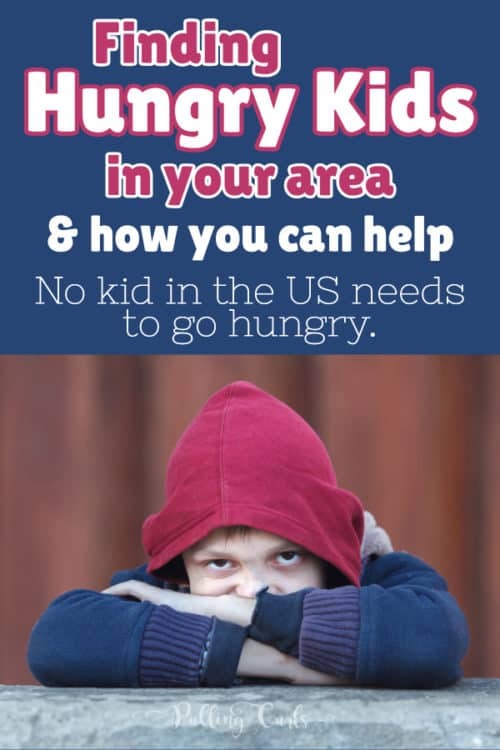 Hungry kids are hungry kids — and are likely more forgotten after the holidays. Contact your local school district, see if they have anything already set up that you could help out with. Contact your school’s resource officer. For us, this is a social worker (they often have these at poorer schools — I don’t think every school in our district has one) who helps kids get resources and gain a toolkit for survival regardless of what’s happening (or not happening) at home. Buy in bulk. For me, Costco wasn’t an option as they don’t want to send a GIANT can of peanut butter home with a kid in their backpack. So, smaller items at the grocery store is what worked best (you could also try the dollar store). I did try to get a discount for buying in large quantities, but no grocery store would do that. Be aware that it is a delicate situation. The resource center is adamant that kids aren’t seen getting help from the center, so be thoughtful of that. My kids were aware that these were kids in need, but never had contact with any of the families. I also really tried to involve my kids/their friends so that they could feel the warm spirit of giving. I hope it helped them realize how lucky they are — even if just for a few minutes. A big thanks to everyone who helped out with my service project today. Many happy bellys. I think #LighttheWorld lights me more than those in need. And, these missionaries are maybe my favorite of all time… #LovetheSistersYouAreWith The kyrene resource center is changing a bit, but they are looking for help in the new year. It’s a great cause to volunteer with! A favorite of mine. Stop judging why the situation is happening & do something. Use resources that are already in place when possible and just give to that — I didn’t have to reinvent the wheel, and the organizations were very thankful for our donations. There is so much good we can do in this world — be sure to look for ways to help all year long (it just seems so much easier at Christmas). My friend Katie did something very similar through the Backpack program — I bet her post will inspire you too! Such an amazing story! Very inspiring. Bless you and all who were involved! Thank you! It was a blessing for us!